Reactive shooting is the skill a police officer must rely on when confronted with a suddenly hazardous situation. It is a critical skill that can save officers’ lives, and it is the result of conditioned hand-eye coordination developed by training on Action Target air-powered reactive steel systems. confrontations, we understand that physical skills that require conscious thought or intellectual processing tend to break down rapidly under high levels of stress. If defensive skills and responses are not programmed in at a subconscious level, the sudden stress may cause us to fumble, freeze or panic. It is in this environment that reactive shooting skills are needed. Such reflexive shooting skills can be taught through the use of extremely short time limits, thus pushing the shooter to function at the limits of reaction and response time. This can be compared to learning how to hit a fast moving ball with a bat or racket, or developing the reflexes to block a punch or kick at full speed. 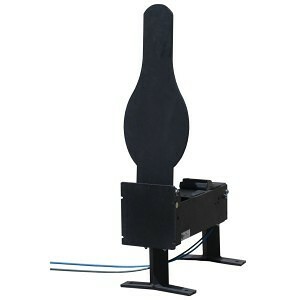 Reactive steel targets provide the instant feedback required to program an officer’s reflexive shooting skills effectively and efficiently. In the effort to provide more insight into Action Target’s line of Reactive Steel targets, you are presented with the Auto Popper™. The Auto-Popper™ is an extremely versatile generalpurpose actuator that is used to lift a wide variety of targets. Instead of walking down range after each drill to reset your pepper poppers by hand, you can now reset them automatically with the just the push of a button. If your scenario requires something other than steel targets, you can quickly change the head attachment to a lifter arm that will accept any size paper or cardboard target. You can even configure the unit for use with military E targets or full size three dimensional targets. You can add an optional control valve to each Auto-Popper™ for independent control over each target, or you can use a single valve to control a group of targets simultaneously. The Auto-Popper is an adjustable actuator that lifts a steel or cardboard/plastic target into view of the shooter by remote control. The rise time of the target can vary from 0.50 seconds to 10 seconds. The power is adjustable to allow the actuator to be used with all types of handgun loads. The Auto-Popper has about 60 ft-lbs of torque in the horizontal position tapering proportionally to 0 when vertical. It can be used with steel, paper, cardboard, and large 3 dimensional targets. The Auto-Popper is capable of independent or tandem operation, it can be used with hit sensors, and it can be controlled by our SmartRange control software. The unit is self-armoring, protecting itself against bullet hits from standard handgun loads coming from a direction within +/-25 degrees of perpendicular. The Auto-Popper is pneumatic powered with a pressure operation n range of 40 psi to 100 psi. It can also be triggered by a 12V signal of less than 60mA. The actuator uses 10.6 cubic inches of air per actuation. It utilizes a “proportional force” cam lifter system to control the reset action and lift action smoothly and reliably. The Auto-Popper is totally field repairable – a complete field rebuild operation can be done by standard range personnel using standard hand tools. The target plate is reversible and easily changeable. The actuator body and front shielding are both constructed of sandblasted and painted 3/8” armor plate steel (AR500). A lumber façade is attached to the actuator to cover the primary steel structure and prevent splatter. The hose and control wires are in a protective sheath. The hose connections use simple push-in type connectors. The actuator provides an interface to EMT carrier for simple installation. The actuator is easily mounted on any flat surface, or it can be placed on legs to elevate the target. If you would like some more information about the Auto Popper™ or other Reactive Steel products, please contact the Territory Manager for your region.